"Very quick and savory dish made with thinly sliced pork loin in combination with butter, wine, and fresh cilantro." I did not care for this recipe. The stated quantities don't work right, it doesn't reduce, you must use flour or corn starch, the pork is sliced much too thin to brown properly, etc. etc. etc. 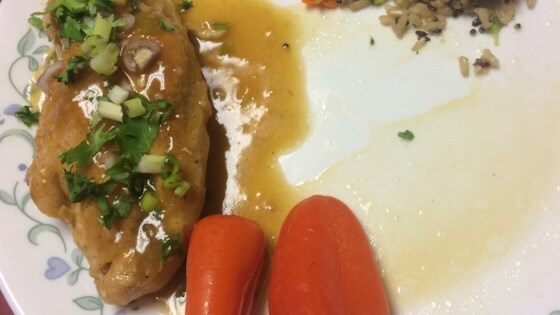 We liked this recipe... but as the other reviewers stated, it doesn't 'thicken'. I know alot of thai dishes don't' thicken' but it seemed like it needed to. I would still prepare this again. This was just okay, I thought the wine taste was a bit too overpowering and I had to add cornstarch to thicken the sauce. I may try it again with less wine.